Where Did ‘the Good War’ Go Wrong? The Good War: Why We Couldn’t Win the War or the Peace in Afghanistan. Jack Fairweather. Basic Books. 416 pages. $29.99. In 2008, during the run-up to the U.S. presidential election, then-Sen. Barack Obama said (referring to Afghanistan), “This is a war we must win.” He then articulated a set of recommendations that he argued would refocus the national strategy away from Iraq, not only countering al Qaeda and the Taliban, but more comprehensively supporting the fledgling government of Afghanistan across the whole of government. Now, well into his second term as commander in chief, the war in Afghanistan seems far from won. What happened? Why has what some have called “the good war” failed to achieve the goals envisioned by the U.S. and others in the aftermath of the 9/11 attacks? In his new book, The Good War, noted journalist Jack Fairweather takes on these challenging questions. His book is certain to elicit both agreement and anger from readers, mostly depending on how, when and where one’s views on Afghanistan have been formed. Nevertheless, Fairweather has the background and experience from which to offer his views. He has spent considerable time in Afghanistan and Pakistan, indeed, throughout the Mideast. He’s sought out the key participants—Americans, Afghans, British and many others—to ensure he presents alternative viewpoints and perspectives. The book is well-documented and is, in that vein, a useful reference for those who seek to study further the many complexities of Afghanistan. Chapter 2, “Bloody Hell,” offers a concise history: Essentially, how did the Afghanistan of the early 21st century get to the point where it became the principal safe haven for al Qaeda? He quotes a young Winston Churchill, who was stationed in Afghanistan in 1897: “A continual state of feud and strife prevails through the land. … Every man’s hand is against the other, and all against the stranger.” Perhaps not much has changed in the intervening 100-plus years. Throughout the book, Fairweather quite effectively weaves tactical, local-level insights into broader, strategic themes and issues. He leaves the reader with a sense of the challenges encountered by successive attempts by non-Afghans to bring order to this long-troubled country. His is an easy style, making this exceedingly complex study more understandable, especially to those who have not been immersed in Afghan matters over the past decade. istan over the past decade-plus. Most British and American commanders, particularly, are generally characterized as not understanding the environment in which they were operating or, at best, coming too late to that understanding. The author’s description of two of Afghanistan’s most troubled regions—Kunar and Helmand provinces—is illustrative of the oft-competing and almost always counterproductive approaches proposed by successive commanders and diplomats. Many will take issue with his conclusion that the Afghan poppy trade should have been embraced by the Afghan government as a source of revenue, but few can dispute that the counternarcotics program to date has been ineffective. His insights into internal Afghan matters are also useful in understanding the complexities of tribal and familial influences that have befuddled outsiders for centuries. 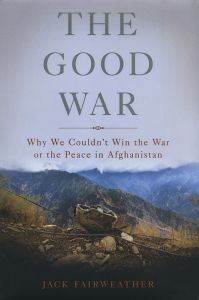 Still, The Good War is a worthwhile read for those who have served in Afghanistan as well as those interested and engaged in the future of Afghanistan and what role the U.S. and others may play. Perhaps most importantly, Fairweather reminds military professionals, strategists and policymakers of the inherent responsibility to develop what the U.S. Army describes as “shared understanding” in the undertaking of future military campaigns. Gen. Carter F. Ham, USA Ret., began his Army service as an enlisted Infantryman in the 82nd Airborne Division. He most recently served as commander, U.S. Africa Command, and is now a senior fellow at AUSA. Means of Persuasion Don’t Wait for the Next War: A Strategy for American Growth and Global Leadership. Gen. Wesley K. Clark, U.S. Army retired. Public Affairs. 250 pages. $26.99. In October 2014, U.S. National Security Advisor Susan Rice was asked on “Meet the Press” whether a White House strategy in fact existed to oppose the so-called Islamic State in Syria. There had been doubts on Capitol Hill. Her answer was firm: Yes, a strategy existed; it was to “degrade and destroy” the Islamic State. Attentive viewers might have worried: Wanting to destroy an opponent, of course, is not a strategy but an objective. Coming up with the means to defeat the Islamic State—largely a spawn of the previous administration’s ambition to, as former Under Secretary of Defense for Policy Douglas J. Feith said, “transform the Middle East and the broader world of Islam”—would be quite something else. Readers of ARMY know the distinction, but it’s one worth re-examining as Iraq and other countries deliquesce into new forms of violence. Strategy, to be sure, is the longer-term deployment of resources. The hallmarks of mastering it are more likely to be clarity and predictability over great distances of time, geography and institutional complexity than they are to be day-to-day elaborations on television. Those who seek to craft it must make the results of their wisdom comprehensible to friend and foe alike. Easier said than done. 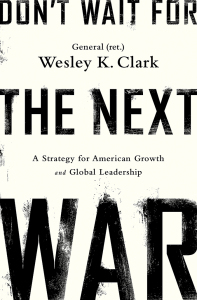 To this end, A Strategy for American Growth and Global Leadership—the cooler subtitle of retired Gen. Wesley K. Clark’s latest book—is timely. The latter years of his career included serving as director of strategic plans and policy (J5) on the Joint Chiefs of Staff and as NATO’s Supreme Allied Commander Europe, where he led allied forces during the war in Kosovo. As a retired general officer thereafter, he had the insight in the months before March 2003 to warn that seizing Baghdad could be done in three weeks, but then to occupy Iraq courted fiasco. He became a 2004 candidate for the Democratic Party presidential nomination once he concluded U.S. foreign policy was flawed. He has been a presence in public debate ever since. Now he offers a “reassessment” of America’s strategic purpose in the world. He does so by examining the challenges of terrorism, cybersecurity, the U.S. financial system, China and climate change, as well as by addressing the Middle Eastern convulsions that today are the most likely cause of any 3 a.m. phone call at the White House. His second chapter, “How America Ended Up in the Middle East,” riveted me for its personal accounts. For example, in late 2002, he called on the current director, J5, while in Washington, D.C. “How are we doing with post-conflict planning?” Clark asked, recognizing that invading Iraq was inevitable. The Strategic Plans and Policy office is one floor directly below the offices of the Secretary and Deputy Secretary of Defense. Clark reports that his successor looked at the ceiling and pointed upward. “They won’t let me do it,” was the reply. Such breadth, by definition, is inherent to strategic analysis. Here, expert practice is followed by persuasive recommendations. Chief among them is how to deploy new economic tools, like a U.S. sovereign wealth fund, that Clark believes can arrive in our hands once the U.S. economy is reinvigorated by achieving energy independence. He envisions this “Energy-Enabled Strategy,” which he calls “E2S” for short, as the way to overcome the diverse military, economic, technological and industrial challenges he lays out in the book. Clark has spent the last 14 years working among financiers, technologists and entrepreneurs big and small, from bankers at Goldman Sachs to entrepreneurs in Africa. His grasp of strategy is honed by business experience. Successful enterprise, after all, especially when conducted internationally, rests on strategic excellence. In turn, executing a course of action depends on aligning strategy with operations and leadership. Don’t Wait for the Next War arrives at a moment when policymakers are poised to repeat mistakes that its author warned about years ago. Incaution is again apparent on Capitol Hill and in foreign policy think tanks. Here’s a key point of strategy: It is not just one’s enemy, in the end, that one must know, but the enduring outlooks and strengths of one’s own side. That would mean gauging popular enthusiasm in America to stick with such a blood-drenched ambition as trying to remake Iraq. It’s on the subject of the Middle East where a gap exists in Clark’s otherwise comprehensive analysis. In October, Secretary of State John F. Kerry warned that the festering Israeli/Palestinian conflict fuels the extremism personified by the Islamic State. In previous years, Gen. Colin L. Powell similarly argued that deadlock over a U.S.-backed two-state solution supports extremism, while Gen. David H. Petraeus testified before Congress that apparent U.S. favoritism to Israel foments anti-American antagonism in the region. Clark skirts this core strategic issue, safely avoiding controversy. The bottom line: On most every count, he delivers an imaginative, tightly argued book that is full of salient details ranging from likely Saudi payoffs in Anbar Province during 2006 to the boost in U.S. gross domestic product by 2020 due to America’s shale resources. Clark fills a vacuum in the nation’s approach to strategy and shows all of us—soldiers, CEOs, entrepreneurs and politicians alike—how our country can again play to its strengths. Derek Leebaert is a director of the U.S. Army Historical Foundation, a partner with the global management consultancy Management Aligned Partners AG and author of Magic and Mayhem: The Delusions of American Foreign Policy from Korea to Afghanistan, among other books. 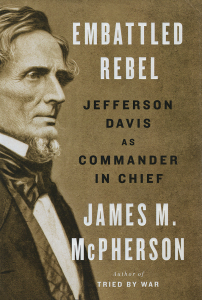 Embattled Rebel: Jefferson Davis as Commander in Chief. James M. McPherson. Penguin Press. 292 pages. $32.95. McPherson brings impressive credentials to the fore in his study of the Confederate president. The acknowledged dean of Civil War historians, McPherson is the George Henry Davis ‘86 professor of history emeritus at Princeton University. He is the bestselling author of numerous books on the Civil War, including Battle Cry of Freedom: The Civil War Era, which won the Pulitzer Prize, as well as Tried by War: Abraham Lincoln as Commander in Chief and For Cause and Comrades: Why Men Fought in the Civil War, both of which won the Lincoln Prize. In addition, McPherson was the first recipient of the prestigious Pritzker Military Library Literature Award for lifetime achievement in military history in 2007. Much of Davis’ efforts as commander in chief focused on maintaining harmony among his field commanders, and much of his censure by historians has centered on his choice of commanders rather than on his choice of strategies. As was the case with Lincoln, nearly 30 percent of Davis’ initial appointments to command in 1861 were influential political leaders with scant military experience. This “fraternity known as ‘political generals’” proved totally ineffective in waging war. Davis’ alleged favoritism toward old West Point classmates and Army comrades, such as Lt. Gen. Leonidas Polk, Gen. Albert Sidney Johnston, Gen. Braxton Bragg and Lt. Gen. John C. Pemberton, caused him to appoint “old friends” to high command. All but Lee failed to measure up to Davis’ expectations. McPherson states categorically that the biggest command headache that Davis encountered in the war remained Bragg’s Army of Tennessee. Bragg’s ability to squander initial battlefield success at Perryville, Ky., and Murfreesboro and Chickamauga, Tenn., led to mass mutiny by his subordinate commanders. Davis’ inability to de-escalate the Army of Tennessee’s internal strife made him appear vacillating when he should have been decisive. Compounding Davis’ problem was the fact that he could not find any commander willing to replace Bragg. Only after Bragg tendered his resignation following the loss of Chattanooga, Tenn., in November 1863 did Davis appoint Gen. Joseph E. Johnston to command. Davis’ problems with the Army of Tennessee did not end there. He relieved Johnston of command and assigned Lt. Gen. John Bell Hood to command of the army in July 1864. Lee said Hood was far too reckless to be an Army commander and recommended that Davis not promote Hood to Army-level command. Davis was undeterred, and the transfer of command of the Army of Tennessee proved to be the president’s “most divisive and fateful proceeding as commander in chief.” Hood’s invasion of east Tennessee following Sherman’s capture of Atlanta was “wrongheaded,” and Davis’ approval of that invasion constituted his worst strategic error of the war.